There are few things in baseball which can automatically deliver a World Series Championship to a franchise. However, firing Buck Showalter is one of those things. Twice before last season Showalter was fired - by the Yankees in 1995 and the Diamonbacks in 2000 - and twice the team that fired him won the World Series the following season. This season, the Texas Rangers try to make it three in a row, having fired Showalter this off-season. New manager Ron Washington will face many obstacles if he is to get his team to the promised land. The Rangers' pitching staff must hold up better than it has the last five years, the Rangers' patchwork outfield must perform well after losing Carlos Lee, Laynce Nix, Kevin Mench, and Gary Mathews, and young sluggers Hank Blalock and Mark Teixeira must overcome down seasons. Rod Barajas has moved on and in his place is Gerald Laird, who will be the full time catcher after part time duty each of the last four years. He was outstanding for Oklahoma in Triple-A in 2005, strikes out a ton and hardly ever walks. Two seasons ago, it was clear that Mark Teixeira and Travis Hafner were going to be the next elite American League sluggers. Hafner lived up to the promise, but Teixeira seemed to take a step back the next year. Tex turns 27 in April, and the Rangers will gladly take what he gave them last year, but would rather have the Mark Teixeira of 2005. 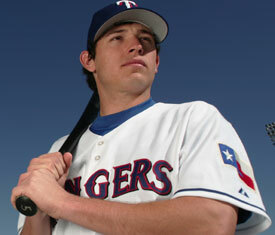 Ian Kinsler will be 25 this season, and has all the tools to be the best second baseman in the American League. Hank Blalock had a down year in 2006. No, wait - Blalock had a down year in 2005, but he was terrible last year. For what it is worth, Blalock got his strikeouts way down last season, striking out 34 fewer times than the year before. Unfortunately, all of his other numbers also declined. The good news is that he is only 26 this season, and should be able to rebound nicely. Michael Young has spent his entire career in Texas. His career batting average is 49 points higher at home, and his OPS is 135 points higher there than on the road. Young has had four straight seasons with 200 or more hits, and is a career .300 hitter, but if he played for a team that played in an average hitter's park, he would be significantly less impressive. His 52 doubles and 103 RBI last season do impress, but he hit into an unforgiveable 27 double plays. And oh by the way, Young led the American League in outs last season. Rangers Fun Fact - Sammy Sosa joins Jerry Hairston on the 2007 Rangers roster; Sosa was traded to the Orioles for Hairston before the 2005 season. The good news for the Rangers is that none of the outfielders they lost were as good as they were cracked up to be - each of them will perform poorly now that they don't play their home games in Texas. The bad news is that Brad Wilkerson hit .222 last season, Kenny Lofton hasn't played a full season since 2003, and Nelson Cruz posted a .261 on-base percentage in his first major league action last season. Catalanotto is a major upgrade over the Rangers' Designated Hitters a year ago. Sammy Sosa could be exciting in his return, and could play alot if the Rangers are out of it by July. The Rangers will continue to be a hit-first/pitch-maybe team in 2007. Just two years ago, this team had Chris Young and Kenny Rogers in its rotation, now they have Kevin Millwood and Vicente Padilla. Assuming for the sake of argument that Millwood and Padilla fare well this season, Robinson Tejeda is a walk machine (83 in 159.1 career innings), Brandon McCarthy is a homerun machine (30 in 151.2 career innings), and Jamey Wright is a terrible machine (5.14 ERA, 781/723 K/BB in 1461.2 career innings). The Rangers will need to do better. Eric Gagne is the big acquisition here, and he starts the season on the DL. Otsuka is a very good pitcher who is also 35 this season. Ron Mahay averaged just under a K/IP last season, and is 36 this season. Joaquin Benoit has a very strong arm but can also be wild. Not a lot of options for the Rangers here. The question for the Rangers, as usual, is whether their offense can score enough runs to make up for their pitching. The answer for the Rangers, as usual, is probably not.